From the Linen Berry Collection. 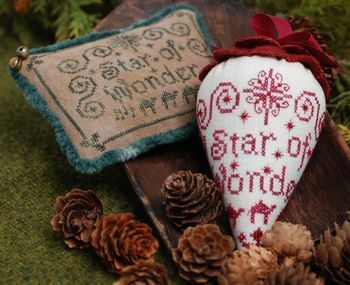 "Star of Wonder" is part of the Caroling Berries Series. The berry model is stitched over two threads on 36ct Tycho linen by Picture This Plus. Stitch count is 127w x 72h. The cushion model is stitched over two threads on 40ct Ale linen by Picture This Plus. Stitch count is 79w x 55h.